Chateau Saint-Aubin has been in the Castro Family for 90 years. It is now run by the third generation, represented by Vincent Fernandez de Castro. Though he was born into the business, he felt he had to experience winemaking in other areas. So, he set his sights on vineyards in Portugal, Lebanon, Greece and South Africa before coming back to his family roots. The Bordelaise like to say that the soil of Bordeaux changes with every step. That's what accounts for the patchwork quilt of vineyards that would seem close enough to make similar wines but don't. 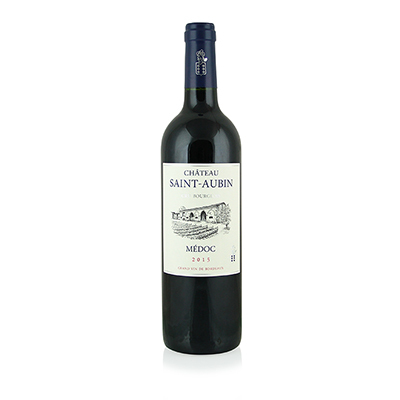 In this case, Saint-Aubin is classified as a Cru Bourgeois, located in the area of the M?doc. It is literally next door to one of the most famous Bordeaux chateaux, Cos d'Estournel in Saint-Estephe, and their 2015 wine sells for upwards of $200! I guess you could call those very expensive steps. Our selection contains splashes of other grapes, but it's 50% Merlot and 25% Cabernet Sauvignon, which accounts for the power and presence of the wine. Add to that the fact that the 2015 vintage was one of the best in Bordeaux ever, and you almost can't go wrong. Our Saint-Aubin is definitely the right stuff. Here are all the reasons why Bordeaux is the most popular wine in the world. From the classic nose of tobacco, saddle leather and fresh earth mixed with cassis and plum, to the cherry infused palate and gripping finish, all it says at every turn is great Bordeaux.